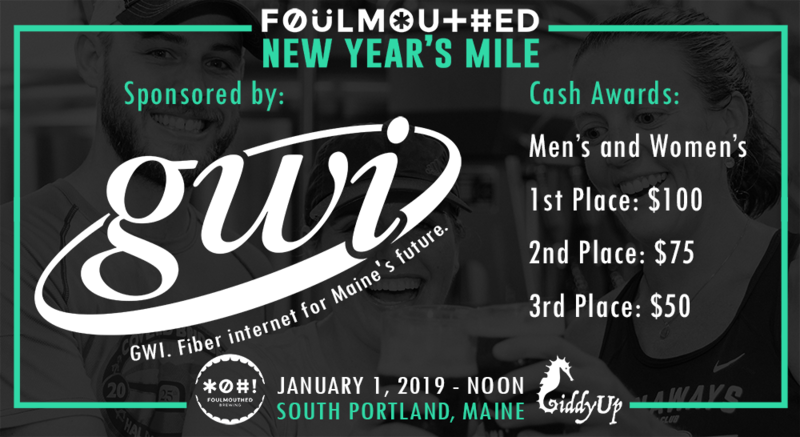 Kick off your year right by running a mile, having specially brewed beer by Foulmouthed Brewing, and a great time at the inaugural Foulmouthed New Year's Mile run on January 1st, 2019 at noon! Following the race all participants (21+) will receive a 16 oz glass mug pre-filled with beer. Underage participants will just receive the mug (no beer). Top 3 males and females will earn themselves a bit of glory and a CASH prize! This is a USATF Certified course (ME18005JK). January 1st in Maine can be quite cold! Please be sure to dress warm as the race will be held regardless of snow and temperature conditions. Please carpool with your friends and family. There is no parking at the brewery or above A Street. We suggest that you find a place to park before arriving at the brewery and then walk a couple of blocks. You may park on city streets where it’s allowed. There’s a huge parking lot near the McDonald’s restaurant at 150 Waterman Drive. 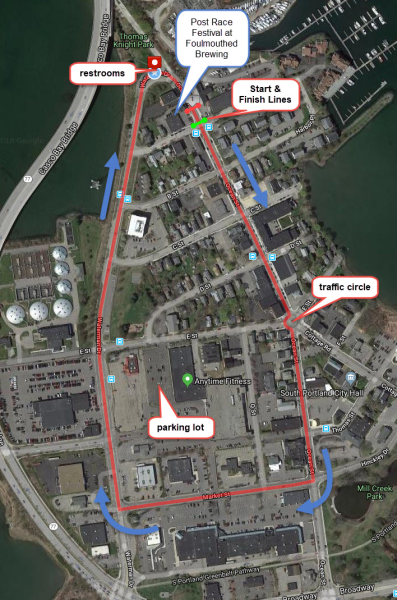 You can pick up your bib before the race starting at 10:00am to 11:55am on race day inside Foulmouthed Brewing at 15 Ocean St, South Portland, Maine near the start / finish line. Please bring your valid I.D. to receive a wristband for ease of entrance to the post race beer garden (only 21+ may receive a wristband and post race beer). 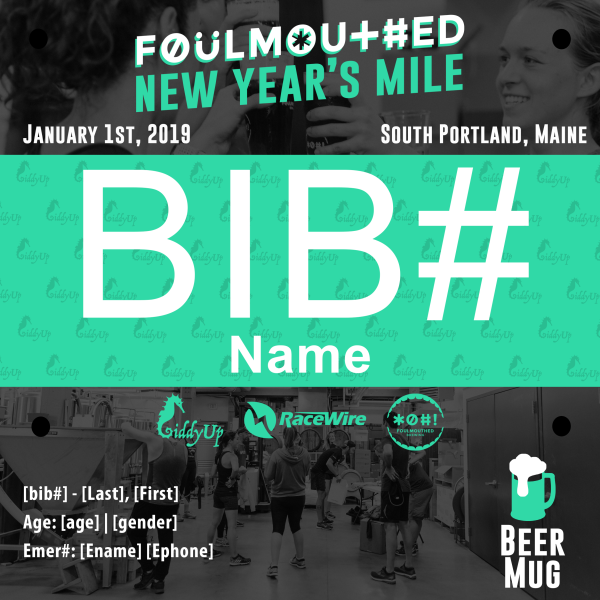 Following the race runners who are 21+, will be invited to Foulmouthed Brewery to receive their memorial 16 oz glass mug fill with a complimentary beer included with their entry fee. A beer garden will be setup outside in the brewery parking lot. Please have your I.D. with you if you did not receive a wristband during bib pick up. Registrants who are under 21 will receive a glass mug inside the brewery however it will not be filled with beer. In addition, runners who place first in the age group (by gender) will receive some amazing Foulmouthed Brewing apparel and gifts. 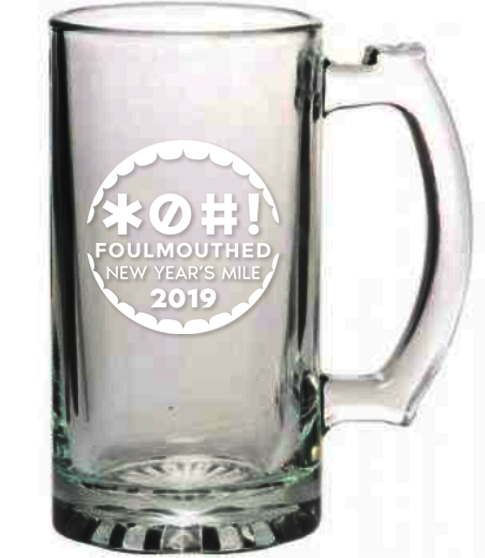 All participants will receive a 16oz commemorative Foulmouthed New Year's Mile glass mug after the race, filled with Foulmouthed Brewing's, Brat German style amber ale! Foulmouthed Brewing will be proudly serving up their delicious Brat, a German style amber ale. 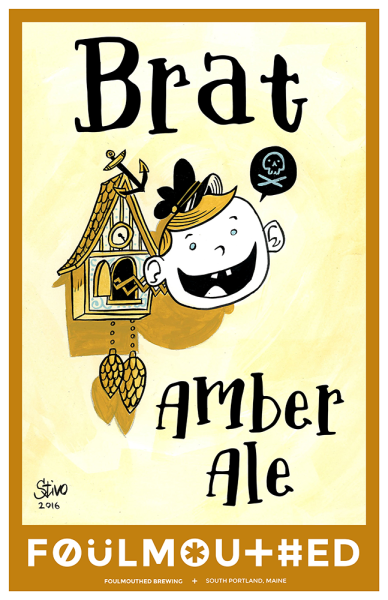 Malty and crisp with well rounded flavors from Vienna and Munich malts and classic Czech and German Noble hops, 4.2%abv. Register before December 10th to receive a personalized bib for the race! Yes. Strollers are permitted. Please be sure to line up at the back of the start chute so that you don't get trampled or create a log-jam behind you. Children in strollers do not need to register. 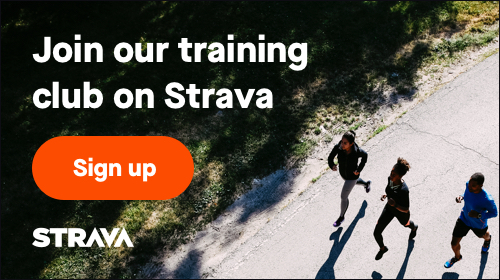 Please download and view the Runners' Guide to get the latest news about the race.